A built in Sunon fan helps keep them cool for increased longevity. Optic lenses are available for applications needing smaller beam angles, 45 or 120deg. 150W 185W 240W 320W 400W are available,too! get details by email info@rayoulighting.com,thanks! 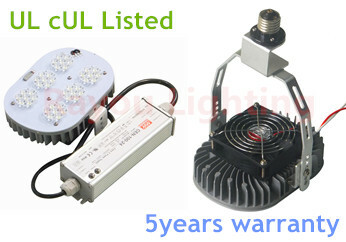 1, LED RetroFit Kits can replace existing Metal Halide or HPS bulbs, the old housings will be re-used. 240W...22800 lumens, which replaces 800w-1000W MH or HPS, used in all situations. 1.Remove the existing ballast and bulb. 3.Screw in the LED Retrofit kit into the existing socket. We have E26/E27/E39/ E40 sockets. 4.Wire the driver to the LED Head. The socket is only used to hold the retrofit kit. It remains un-powered. LED retrofit kits is maily used to replace MH or MPS lamp,such as Street light fixtures, high bay fixtures, shoebox fixtures, wall pack fixtures, canopy fixtures etc.